The construction industry has the bad reputation of being one of the most polluting industries worldwide. Recent studies found that the industry is the greatest consumer of natural resources and energy, while at the same time the greatest dumper of waste. Buildings can usually not adapt well to new usages and, as a result, they are torn down. This problem is intensifying as our society is changing at an increasing speed. It is clear that thorough and systemic changes are urgently needed to contribute to global sustainability. The big question is then how we can design buildings that can transform over time to fit new usages and that consume fewer virgin resources. That question has been addressed at the International Design Studio of 2016. 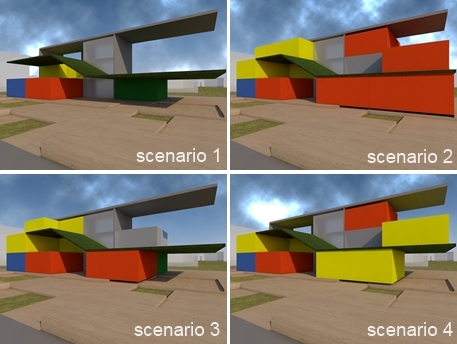 Develop design concept for a Dynamic multipurpose structure that will actively interact with changing climate, energy/water concept and boost material circularity on one hand side and support [short] term and long term use changes on the other hand. 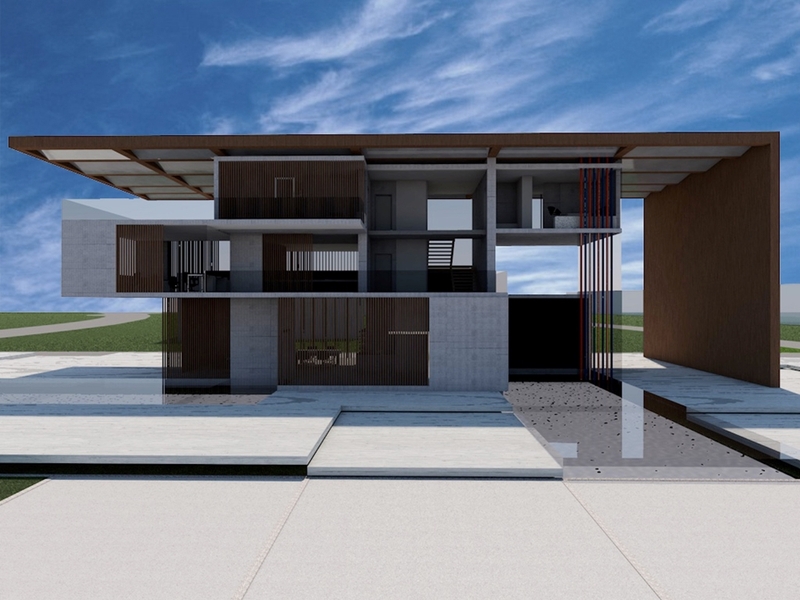 The International Design Studio is a collaborative architecture course conducted between the University of Twente, Istanbul Technical University and the University of Sarajevo. MSc and PhD students from these three universities have been working together on a real design project: the Green Transformable Building Lab (GTBLab) that will be built in Heerlen, the Netherlands. The GTBLab is a research laboratory for studying and testing new concepts and production processes for transformation and reuse of building and building parts. This exciting building is scheduled to transform a year after it is built, and thereafter again two times. The course challenged students to develop a dynamic design concept that supports these uses changes, interacts with a changing climate and boosts material circularity. The design process is hereby seen as a research method: we are trying to acquire new knowledge through the act of making. As a participant of the course, I present some of my reflections here. Kicking off the project in Sarajevo, we explored in couples how alternative cores could support the transformations planned in the design brief. A core is in this context seen as the main structural and/or installation component that defines the flexibility of spaces. In building transformations, the core is permanent: while the rest of a building can adapt to new usages, the core remains the same. There are several kinds of cores imaginable, for example as an outer shell that provides much vertical flexibility (like the Amsterdam canal houses). We looked at a core principle, based on the Centre Pompidou in Paris. This type is characterized by a superstructure that spans large horizontal spaces. The load-bearing structure and the installations form an outer shell that provides transformation possibilities within. 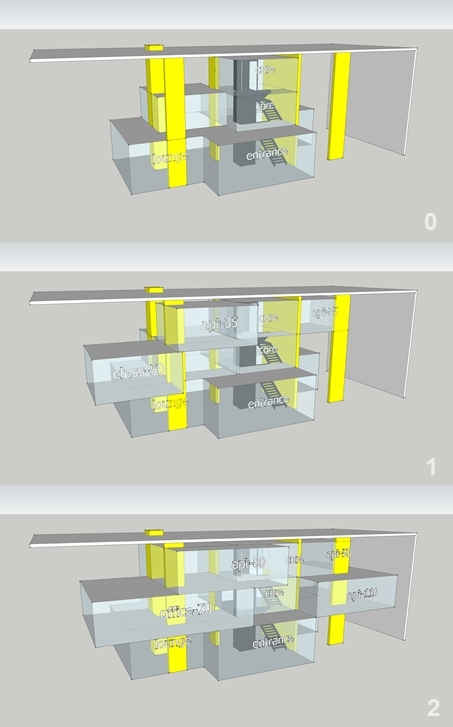 As specified in the design brief, three transformation scenarios for the GTBLab with floor areas of about 150, 300 and 450 m2 had to be considered with different functional typologies (housing, office and education). 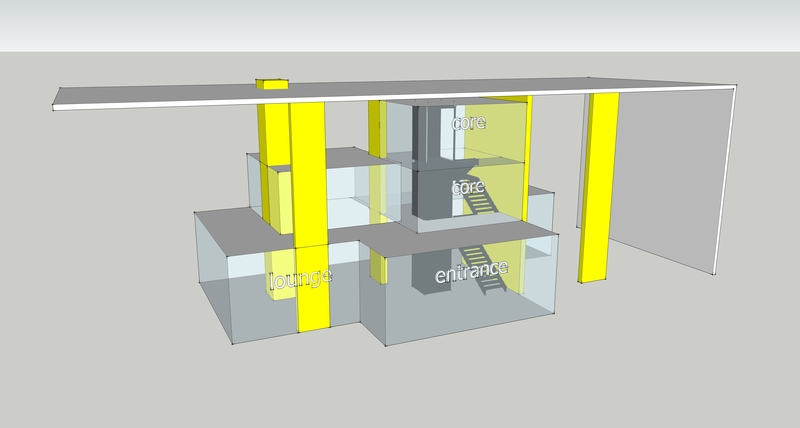 We thus came up with a draft design that consists of a ground floor of about 150 m2 and then extends vertically with one or two floors in the other scenarios. A staircase at the outside of the building is then added to the building in those scenarios. Our exploration of this core revealed that this type of core provides much horizontal flexibility, but restricts the position of certain rooms in the building (like the wet cells). Additionally, daylight issues might occur due to the large horizontal span widths. 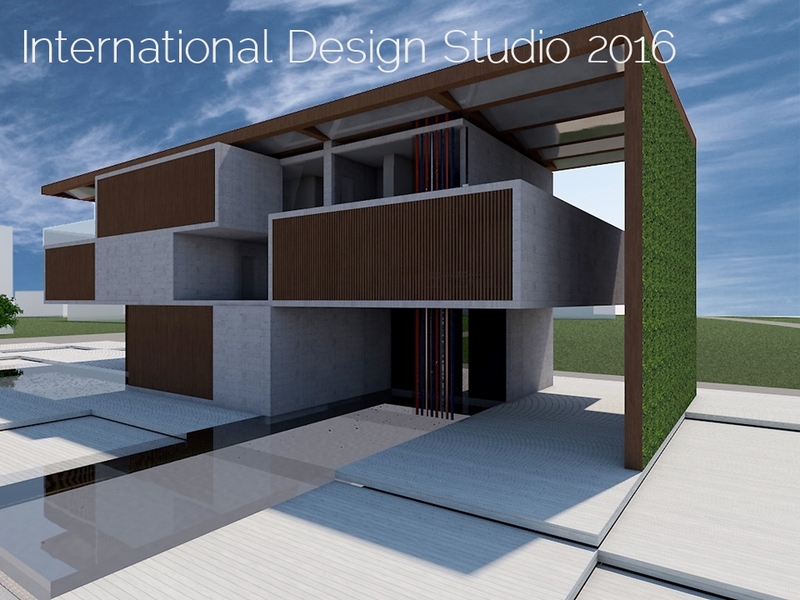 The next phase of the International Design Studio took place in Istanbul. With new group compositions, it was decided that our group would continue the project with redesigning the final architectural design of a previous design studio. 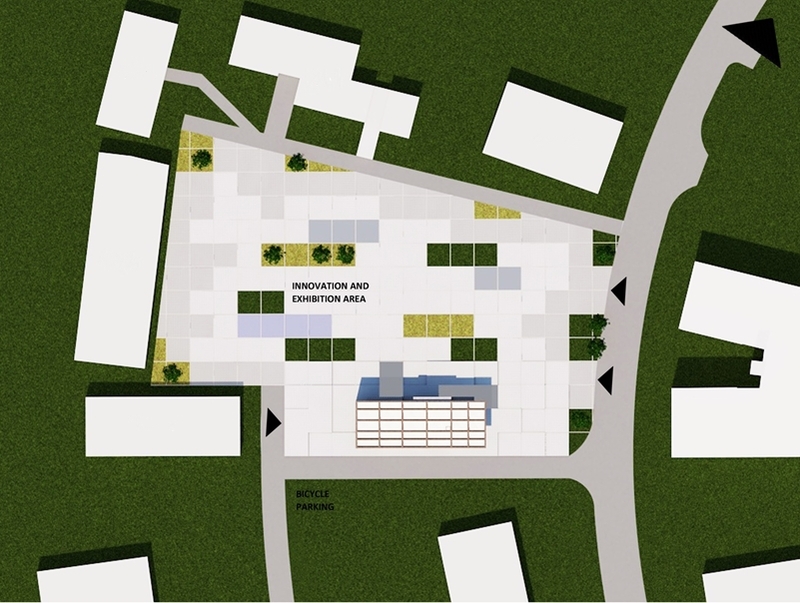 Since it was originally the plan that the GTBLab would be built in Enschede, that previous design would not fit the new location in Heerlen. We were thus challenged to work on a redesign, taking into account original design principles such as the location of the inner core and some architectural features. This phase therefore started with an extensive analysis of the construction site. As such, we studied the building volumes and functions of adjourning buildings, the accessibility of the area and sight lines. We also looked into environmental influences on the planned building (such as the sun angle, temperatures and wind speed at different times during the year). Based on the analyses, we designed a platform for the GTBLab on a modular grid of 6×6 m. The platform stepwise dissolves into the public ‘innovation’ square (I got inspiration for that idea when I saw a mockup of the LEGO House at the airport of Billund, Denmark). 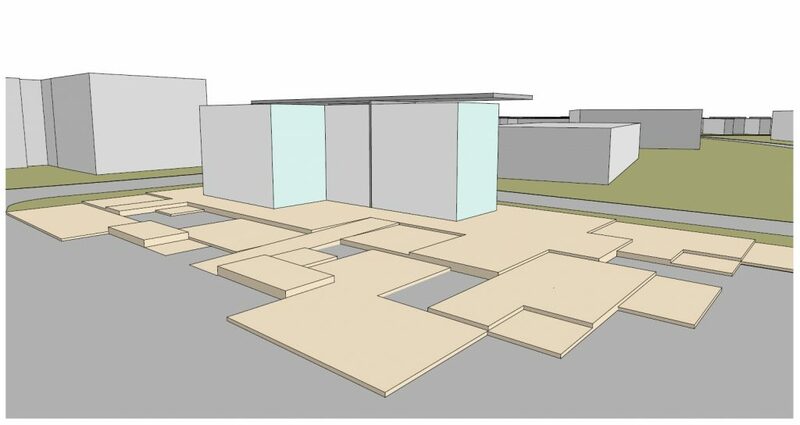 The design for the square furthermore includes water, greenery and a walk around for an exhibition space. The GTBLab is facing the public square, which means it is turning north. The characteristic L-shaped overhangs of the previous design (meant to provide shadow) are therefore partly redundant and changed. Load-bearing walls and installation shafts could nevertheless stay in the same positions (despite an increase in grid size). The design furthermore includes a natural ventilation system (from the room units to the staircase) and a tank for rainwater collection under the building’s platform. We illustrated with floor plans and a 3D model that the central core in the design allows for ‘plug and play’ transformations of the building. Housing, office or educational rooms can be added or removed from the building by attaching or detaching them from the core. The final part of the International Design Studio was in Maastricht, close to the (planned) construction site of the GTBLab. After integrating two ‘redesign’ proposals, our goal was now to elaborate and improve the outcomes of the workshop in Istanbul. We worked, for example, on the materialization of the façade, detailed floor plans and integration of the climate/energy systems. The public innovation square implements the pixelar idea of the building’s platform. Some of the 6×6 stony surface elements are alternated with vegetation and water, creating a visually attractive square capable to host public exhibitions. The roof structure of the GTBLab is changed significantly. We completely removed the characteristic L-shaped overhang at the north side. Its function (providing shadows) was not relevant any longer and keeping it would maintain an unwanted barrier between the building and the square. We furthermore extended the L-shaped roof to the street side – mainly for aesthetic reasons. The large green wall is moved a bit to the back to create a passageway between the square and the back (south) side of the building. The main materials for the façade are wire mesh and wooden panels; both are movable and can provide shadow whenever wanted. The energy/climate concept is well integrated in the design. 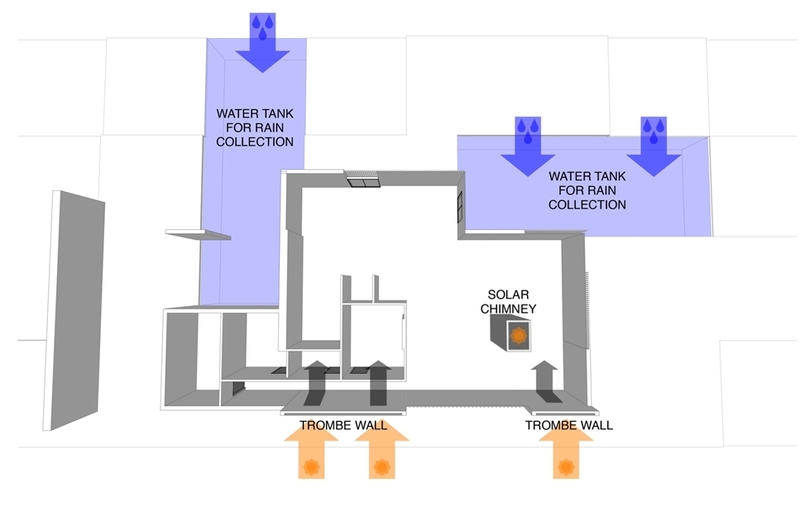 A solar chimney and Trombe wall offer natural ventilation and contribute to heating and cooling the building in all seasons. Solar panels on the roof generate the necessary electricity. Rainwater is collected on the roof and stored under the building’s platform for reuse. Glass floor panels make this water tank visible. Preparing the building for future transformations was again a challenge: all units need to be connected to the core, positioned logically and proportionate to the overall building. The basic scenario, ultimately, contains a number of spaces that remain the same during all transformations: a public lounge, storage space, toilet groups and vertical circulations. This base configuration is extended with more box-shaped rooms during the first and second scenario. The design efforts for the GTBLab have generated much practical insights for dynamic and circular building. Here, I drew some lessons based on the work I participated in during the International Design Studio in Sarajevo, Istanbul and Maastricht. The design outcomes of all student groups were presented at an international symposium on Reversible Building Design in Maastricht, June 2016. These will be used to define the final design of the actual GTBLab. The construction of this multipurpose building will commence at the end of this year. The International Design Studio 2016 concluded with awarding certificates of recognition to the MSc and PhD students that participated in the course. Credits: I worked together with Alp, Annika Elsa, Emily, Çağlasu and Tuğçe for this project.